Amy’s book, “The Simple Faith of Mister Rogers,” arrived unexpectedly in the early days of planning our documentary. At the time, we had little beyond PBS’ “America’s Favorite Neighbor” documentary and some random Internet searches to provide us background or direction. Amy’s book probed more deeply into Mister Rogers’ upbringing than anything prior. She thoughtfully chronicled her personal relationship with Mister Rogers, while providing insight into the roots of his spirituality. Not only was Amy our first interview way back in in June 2006 (see “Equal Turns”), she opened her home to Chris and me, poured over letters, photos and memories, and availed us her scarcely-seen CBN interviews — the first and only interviews during which Mister Rogers explicitly addressed his faith. When “Mister Rogers & Me” won a Heartland Film Festival award, Amy was there. 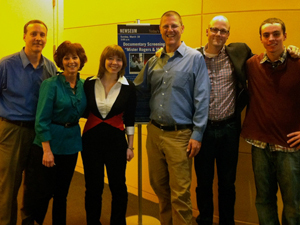 Two years later, when we premiered at Washington, DC’s Newseum, Amy (and her family) was there. In the years between, via email, Facebook posts and phone calls, Amy been a constant presence, a sounding board, advisor, supporter and friend. It may have been unlikely beach read for my first 24 hours of Island Time. Slammed by work, overwhelmed by two children under two, unwinding, unplugging, connecting with my deeper self, my deeper relationship with my wife, and the deeper universe was crucial. So perhaps it was the ideal read. Where I expected “Tuesday’s With Morrie” — a gauzy, nostalgic remembrance of an aging, former teacher’s influence — I got instead a book like none other I’d read. In “Letters from the Closet,” memory, correspondences, and life experience combine not only to illuminate why Amy (and We) write (or teach, or swim, or dream), but also who Amy is — and ultimately, who are — at her deepest, most complex, messy and vulnerable. There is a stream of consciousness to this book that felt like a radical departure from “Simple Faith.” These twists and turns reveal the depth and breadth of Amy’s knowledge and wide ranging interests: philosophy, theology, literature and history. through her expert, courageous spelunking, there is map, or process, or allowance for all of us to go deeper. In a world of soundbites and shallow binaries, Amy offers very gray, very real insights into not only her relationship with her sometimes inspiring, sometimes provoking English teacher, but all relationships. It isn’t gauzy or nostalgic; it’s real. I would not be the person I am today were it not for Amy. And not solely because she encourages me, and believes in me. Amy tells me the truth, corrects my grammar, and shows me in deeds, not just words, how to set my aim higher. Iowa Homecoming For "Mister Rogers & Me"
Mister Rogers Goes Hollywood With Tim Madigan... And MTV?